This is not a post I expected to be writing even as recently as a year ago. Although I’ve been a reader of comics for ages, for most of that time I stayed away from superhero stuff — more because I found it daunting than anything else. However, as some of you will have noticed, I’ve spent the past year getting acquainted with Carol Danvers, Kamala Khan, Jennifer Walters, Ororo Munroe, Hope Summers, and so on. I can trace the changes in my reading habits to Comics and Super Women Week at Lady Business, as well as to the ascendency of Panels and to Memory’s excellent My Year with Marvel feature. Suddenly there were all these people with similar interests to mine telling me exactly where to start, which made this vast, formerly unapproachable story universe much easier to navigate. 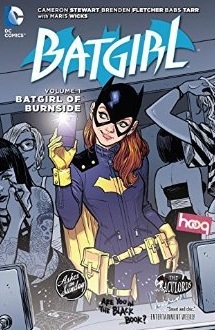 The Batgirl of Burnside follows Barbara Gordon as she moves to a new area of Gotham (kind of the local equivalent to Hackney, by the sound of it), gets to know her new roommate, and attempts to get back to her graduate research. Things soon take a turn for the complicated, though, when it emerges that someone other than Barbara is using the Batgirl identity to tarnish her reputation. Also, there just might be a sinister side to Barbara’s seemingly innocent research project, one she’ll have to confront before someone gets hurt. The good, of which there’s plenty: this comic was really easy to get into, despite my complete lack of background knowledge when it comes to the history of Gotham City and its inhabitants. It probably helped than it’s personal and small-scale rather than epic, which tends to work better for me in general: the story is largely about a twenty-something making friends with other women, going on occasional dates, and trying to navigate her work, the world in general, and her place in it. Lastly, I loved the art and the fact that the bright colour scheme goes with the comic’s fun, pop culture-infused feel in a way that doesn’t ever feel artificial or rammed in. 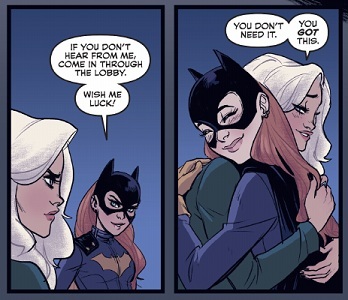 The problem with Batgirl #37 is that it felt lazy. 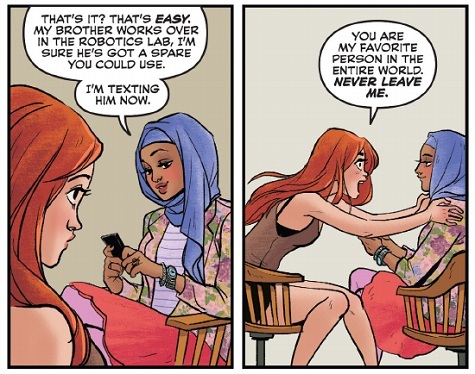 What could have been an incredibly intriguing arc about stolen identities and the complexities of trying to establish yourself had been reduced to a tired, harmful trope which (unsurprisingly) stung many people within the community. 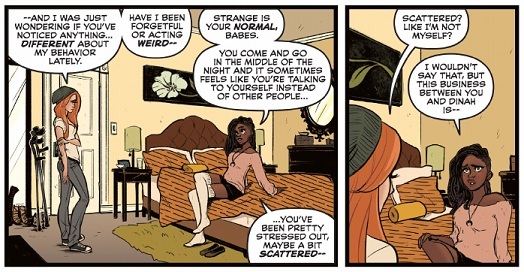 While we don’t know how Dagger Type identifies, or even where exactly the team is going with the story, this presentation of the character paints an awful picture of drag queens, trans women, and non-binary people alike. It props up the trope of the “crazy, unstable drag queen / trans woman”. Fortunately the creative team behind Batgirl appears to have listened, and apologised shortly after the comic came out. So here’s to a future with more of what makes this series so enjoyable and no more random transphobia. One last thing: my lack of DC knowledge also meant I didn’t know at first that Barbara Gordon was formerly a disabled character, who was “miraculously cured” as part of DC’s New 52 relaunch. This is disappointing for a number of obvious reasons. 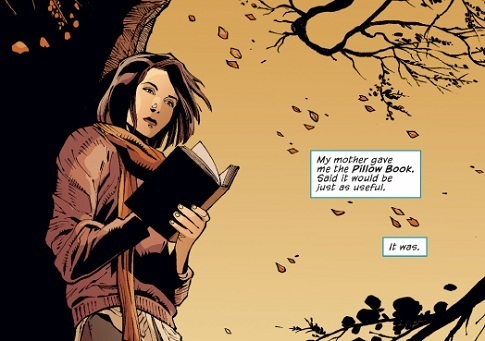 I would love to read more about Barbara’s time as Oracle; Gail Simone’s run of Birds of Prey is now also on my comics wishlist. 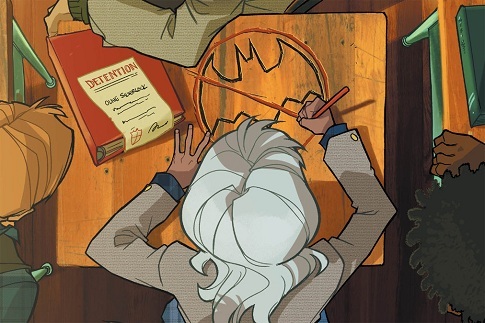 Gotham Academy is about Olive Silverlock, a student at Gotham City’s most prestigious boarding school. Olive has had a strange summer: something big she can’t remember happened, and now she’s finding it hard to get back into the usual routine of school. Olive has also become withdrawn, and for the most part she avoids her friends and her ex-boyfriend Kyle. But Olive is put in charge of showing new student Maps Mizoguchi (who just so happens to be Kyle’s little sister) around; before they know it, the two are sucked into a school secret involving an old secret diary, a possible ghost, hidden passageways, a sealed off building on campus, and mysterious strangers. This book in one word: awww. I mean, it’s gothic and deliciously atmospheric, but in a really adorable way. 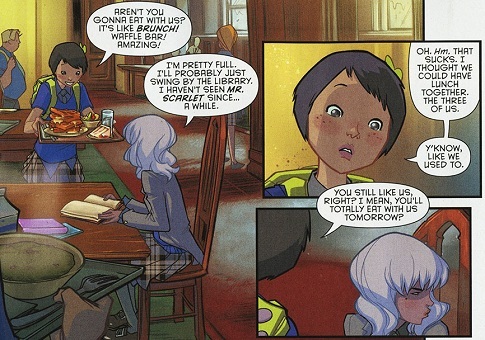 It also makes use of plenty of story devices I love, and I mean this in an entirely positive way: Gotham Academy successfully combines haunted mansions, ghost stories, mysteries and school stories to create something with a unique feel. Also, it has girls collaborating to solve a mystery, plus friendship and plenty of feelings. I love how Maps doesn’t give up on Olive even though she’s having a hard time, and I love how we get to watch her open up slowly and rebuild her trust in the people around her. 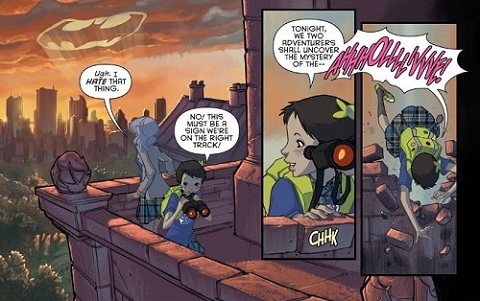 At the end of Welcome to Gotham Academy, Olive has found a place among her friends. This doesn’t mean her struggles are over, but hopefully it means they’ll be a little easier to weather. The story this first collection introduces has ties to the wider mythology of Gotham City, but remains accessible for a newbie such as myself, whose context mostly comes from pop culture osmosis. Also, did I mention how much fun this book is? More, please. I was a little nervous about using volume six as an entry point to a series I knew nothing about, even after being told this issue introduced a new creative team and marked a transition for the series. I’m happy to say I was fine, though: this post has some very useful information if you want to do your homework (and also an excellent pitch for the series), but if you just start reading you’ll pick up the context in no time. The premise is this: Selina Kyle, aka Catwoman, has become the head of the Calabrese mob family, which means she’s in the position to be the overall Crime Boss of Gotham City. Selina intends to use her new role to make things not quite as terrible as they would be if someone else was in charge, though she’d be the first to acknowledge that may not be what it looks like from the outside. And of course, she has to expend an awful lot of time protecting her new position and ensuring the other Gotham mob families remain loyal to the Calabrese — a task whose cost is sometimes very high. The various issues that form Keeper of the Castle are framed by quotes by and historical facts about women in positions of power they had to defend at all costs — Lucrezia Borgias, Elizabeth I, Ching Shih, Cleopatra — which not only set the tone for the story but highlight what it’s doing thematically. Keeper of the Castle is, I think, a good example of me feeling doubtful about a pattern while really valuing an individual story that embodies it. Please bear with me as I attempt to articulate a complicated and half-formed thought: I’m wary of the cultural capital stories about people who do dark, often violent things in the name of preventing greater evils seem to enjoy. I’m especially wary of the sense of inevitability we shroud them in, and of how easily this fits with a certain view of the world, or with cultural narratives about the one true way to exercise power, achieve success, or effectively stop terrible threats. However, it would be unfair to say that this series doesn’t engage with these questions. Additionally, our world currently (which, again, is not the same as inevitably) puts people in thankless, impossible positions with alarming frequency, and as long as we continue to celebrate stories about what it’s like to be in their shoes, I want these stories to be about women, too. I want to see stories where women seize power and do it well; stories that chip away at the idea we’re “naturally” gentler and softer (even if these are traits I personally value). I especially want stories where women are able to claim the same sympathy we extend to ethically ambiguous men without even pausing to think about it. I want to take a long, hard look at the circumstances that make them believe dark deeds are the only way, and watch as they attempt to live with lingering questions about whether this is really the case day after day. So far Valentine’s Catwoman is excellent at this, and this is something I value a lot. Also, Selina’s relationship with Eiko Hasigawa, a member of a prominent Yakuza family, was absolutely wonderful. 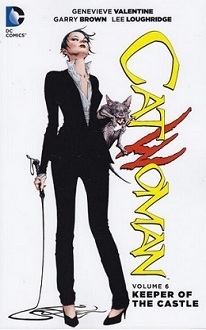 Not only for the sexual tension between the two (which culminates in a kiss scene that, importantly, makes Selina’s bisexuality a part of the Catwoman canon), but also for the role Eiko comes to play in Selina’s life: she’s the one who expects better of her, and who thus reminds her that perhaps she can do better after all. Whether this is something Selina can afford in Gotham City remains to be seen. Black Canary is amazing so far, you should totally check it out. I normally wait until I can read comics in paperback (which probably means I'm not a "real" fan, hee) but this is my one exception, I'm buying the issues as they come out. I'm not a real fan either, because the only comic I've done that for so far is Lumberjanes :P There are several others that tempt me (include Black Canary), but the cost does add up. I'm thrilled to hear it's as amazing as it sounds, though! I am not sure if I really read any DC comics. I wish they would get something like Marvel Unlimited! I know, it would make life so much easier. 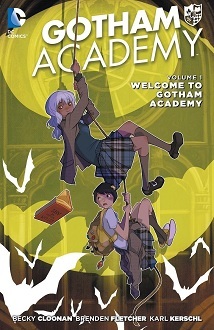 You should read these, though - especially Gotham Academy, which I think is especially you. 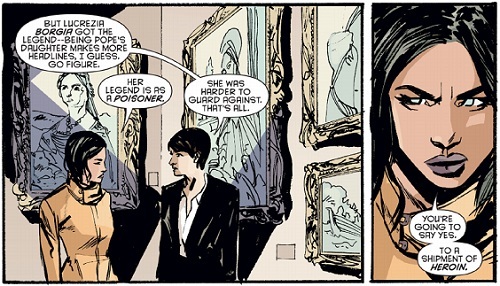 I really love the art on those Catwoman pages; I might have to give those a try. 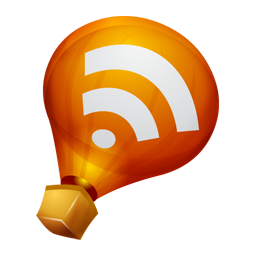 Thanks for the writeup! You're most welcome and I hope you enjoy it! You were not kidding about Olive's dislike for Batman :P Thanks for getting me into it; it was a ton of fun.